BirdCouple does the Appalachian Trail in Pennsylvania.... with adorable son #2, Adam. With only one one day of the weekend left after soccer tournaments all weekend, we drove up to Hamburg, PA and crashed at a local motel and woke early to meet Scott for transport to the trail. Look! PA and no rocks! We met two other young hikers from the great state of Pennsylvania. The joke among PA hikers is that PA has no unemployment because the governor sends everyone out at night to put rocks on the trail. And, then the boulders began. This is the mound of rocks otherwise known as the Appalachian Trail in PA. After this little rock scramble, we hit something called Knife Edge. Knife Edge was the closest thing to rock climbing that Warren and I have encountered on the trail to date. Yes, it is a wimpy little climb compared to anything we will experience further North. Yes, we had the advantage of climbing it with only day packs (slack packing), while thru hikers do it with 20-40lbs on their backs. And, yes, Adam bounded up the boulders like a mountain goat while Warren marched over the rocks. I crawled up on my hands and knees, without looking down. I was so focused on crawling and looking for rattlesnakes, I forgot to take a picture. A search for Knife Edge provided this.... Ok, this is actually the infamous Knife Edge Trail to reach Mt. 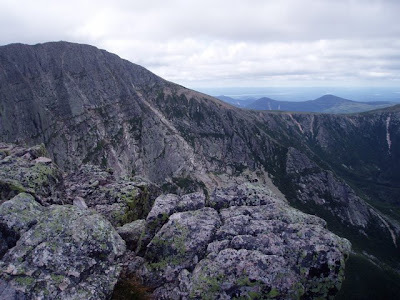 Katahdin, the northern terminus of the Appalachian Trail. The Knife Edge Trail is an alternate route to Mt. Katahdin. Right? The Knife Edge Trail is not the Appalachian Trail. Right? Cute Husband, we are purists, we don't do alternate routes... Right? Yes, there were rocks and more rocks. But there also were some beautiful overlooks to enjoy on a beautiful day. About 4 miles into our hike, Warren and I celebrated completing 400 miles of the 2,175! Our goal of 100 miles per year will put us on Mt. Katahdin in the year 2025....I love goals! Well, I thought it was super cool, but it may have bugged Warren and Adam when I kept saying "See that plant/bug/butterfly/mushroom/toad .... go ahead... ask me what that is...I will just look it up in my new handy dandy field guide!" It came in especially handy when we hiked up to this lovely snake sunning himself on the path. It looks poisonous, doesn't it? Adam wants to see the guide. This is a Milk Snake. Wonderful and non-venomous, which allowed for the fearless up close pictures. And, this beautiful creature blooming beside the trail is Pink Azalea (Pinxter Flower). We also encounter the most wonderful and interesting people on the trail. We met Snake and Shoe at the car as we were finishing our hike. These two gentlemen met on a section hike in 2001 in Georgia. They live hundreds of miles apart, but decided to section hike the remainder of the AT together, doing 200 miles per year. When we met them they had completed almost 1,200 miles of the trail. To celebrate this accomplishment, Shoe decides to get a tattoo which he is now trying to convince Snake into getting. Dedication... love of the trail... what a great way to start the 2008 season!